Credit: DC & Warner Bros. If it has been apparent to you the DC Extended Universe is moving rather quickly to establish its comic book legends on the big screen. Many would say it’s a bad idea or maybe if DC Comics would follow in the footsteps of Marvel‘s development of its films, the success would be beneficial for the fans and the studios involved. With movies like ‘Man of Steel 2‘, Ben Affleck‘s solo ‘Batman‘ movie, ‘Wonder Woman‘, & the ‘Justice League‘ coming out it seems like Barry Allen will finally get the chance to shine on his own when ‘The Flash‘ arrives in early 2018. However, he may not be alone as we got a development for ‘The Flash‘ becoming one step closer to getting cameras rolling. You see the famed yellow and red colors represented clearly on the Funko Pop! Vinyl figure for The Flash but in the faded background you see some gray feet. Now those can be anybody’s feet especially without knowing about the previous Cyborg reports. As of right now, we don’t know a whole lot in terms of specific plot details for The Flash movie, but the pieces of the puzzle are starting to come together. A recent report claimed that members of the villain team The Rogues would be squaring off with Barry Allen in the movie. That would make sense, being that Ezra Miller already appeared as The Flash in Suicide Squad to take down Captain Boomerang, who just so happens to be a member of The Rogues. At the moment, rumor has it Captain Cold and Golden Glider, who have both appeared on The Flash TV show, will be the main villains in the movie. As of now that has yet to be confirmed, but we will surely be learning more details soon now that script revisions appear to be done. 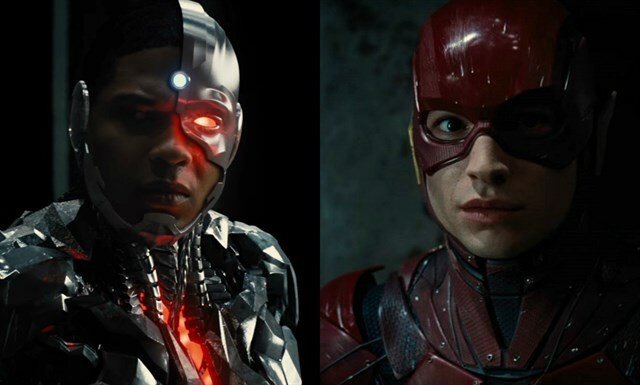 Ezra Miller will be starring as Barry Allen/The Flash, Ray Fisher will reprise his role as Cyborg, Kiersey Clemon as Iris West, and Billy Crudup as Henry Allen (Barry Allen‘s father). The Flash is set for March 16th, 2018 which is only a few months after the arrival of the Justice League on November 17th, 2017.